Joplin Dental Insurance from Joplin Dental Care | No Deductibles! Joplin Dental Insurance from Joplin Dental Care | No Deductibles! Joplin Dental provides great coverage through their VIP Dental Benefit Plan. This is a completely new concept in dental coverage—and that’s just how you are treated when you’re covered by it: like a VIP dental patient. But don’t just take our word for it. Read below for all the details! The VIP Dental Plan works similar to many dental plans on the market. You pay a monthly membership fee for benefit coverage on your dental expenses. The plan is designed to cover preventive services such as cleanings and oral exams. This provides coverage that can be budgeted at an affordable monthly expense while receiving good benefits for your higher cost dental services. Dr. Craig A. Hayes’ office administers the VIP Dental Plan and works with you, the patient, directly to make all dental service decisions. There is no need to contact a 3rd party company for information. All questions regarding plan coverage, verifying benefits, changing coverage types, or any other questions should be directed to us here at Joplin Dental Care. How Do I Use a Dental Specialist? Dr. Hayes or an associate may refer a patient to a specialist that participates in the VIP Dental Program. The VIP Dental Plan offered by Joplin Dental Care is different than most dental plans! It has been designed to provide you and your family with affordable preventive dental coverage that your Joplin dentist owns and administers. Not only does the VIP Dental Plan provide excellent coverage on preventive dentistry, the plan offers good coverage on major dental procedures like crowns, root canals, bridges, and dentures. Since your VIP Dental Plan is not administered by a third party insurance company, all the decisions regarding your dental treatment may be decided by you and your dentist – Dr. Craig A. Hayes, Jr., without the need for claim forms, approvals, deductibles, or waiting periods. The discounts associated with the VIP Dental Plan are available only through Craig A. Hayes, Jr., DDS, PC. Monthly membership fees are to be paid for a minimum twelve (12) month period and are non-refundable. Unless waived by the dentist, membership will automatically renew on the anniversary date and continue thereafter until cancelled, in writing. Qualified dependents are defined as a husband, wife, and any non-married children living in the household under 22 years. Any additional dependents after three (3) each will have an additional surcharge of $15 per month per dependent. Fees and plan discounts are subject to change with notice. Missed or broken appointments without two- business days notice will be charged $75/hr for a regular appointment. Missed or broken appointments without five- business days notice will be charged $250/hr for a conscious sedation appointment. All member co-payments are due at time of service. Membership in the Dental Plan may be terminated for abuse or failure to pay membership fees or properly billed work. The VIP Dental Plan is administered solely by the dental office and may be discontinued at the end of any month, with or without notice. VIP Dental Plan benefits are limited to $2000 per each covered family member per year. Prophylaxis is limited to twice every calendar year. Fluoride treatments are limited to twice every calendar year. A difficult prophylaxis (i.e. heavy smoker, neglected teeth, etc.) is subject to periodontal disease treatment charges. Periodontal cleanings are limited to a $70 benefit, twice every calendar year. All covered replacements are subject to the co-payment percentages as listed in the Schedule of Services and the private fee schedule of Craig A. Hayes, Jr., DDS, PC. A denture, bridge, or other appliance installed under the Plan can be replaced only once during the period of five (5) years after the original date of installation. A denture, bridge, or other appliance can be replaced only if it is unsatisfactory and which cannot be made satisfactory by a reline or repair. There is a $50 lab fee for any service using precious metal. Benefits for Endoseal Implants are limited to $500 per member, per lifetime. Benefits for bleaching of teeth are limited to one initial visit. Conscious sedation dentistry is provided at a $200 benefit, per member-visit. Any dental procedure in progress or performed before or after a member’s eligibility period is excluded. Any dental expense incurred if the dentist is unable to perform a procedure due to the member’s general health or physical condition is excluded. Replacement of a satisfactory filling is excluded. Replacement for lost or stolen dentures, partials, or appliances is excluded. Any dental procedure not listed as a covered service, including but not limited to, anesthesia, prescription medications, trauma to the mouth, emergency dental services, etc. is excluded. Treatment required due to hospital and medical charges or self-inflicted wounds of any kind are excluded. Treatment to correct congenital, developmental, or medically induced dental disorders is excluded (i.e. TMJ). 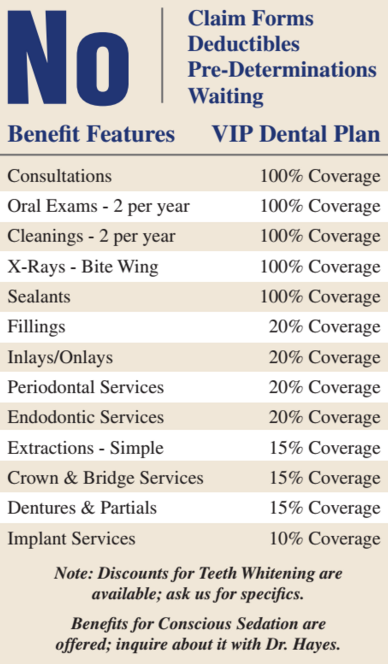 Dental Plan benefits for services provided in association with benefits from another source (i.e. workman’s compensation) are excluded. Coordination of VIP Dental Plan benefits with other dental or insurance plans is excluded.